The marquis matchup of this international break pitted FIFA’s top ranked team, the USA, against world #3–and World Cup hosts–France. For those with an eye ahead to this summer’s World Cup, the matchup was an early look at a likely quarterfinal: if the Americans and France each win their group and the first knockout game, the teams would face off in Paris on June 29. But whether or not the table shakes out as predicted, this was a chance to see whether anyone has a real shot of slowing down the Americans, who came into le Havre riding a 28-game unbeaten streak. But les Bleues didn’t just slow down the Yanks–they left them in the dust, putting together a dominant 3-1 victory that may not have even been as close as that score suggests. France jumped on the Americans early with blazing speed down the right side. Remember the teams’ last match at the She Believes Cup in March of 2018? Eugénie Le Sommer so thoroughly overmatched the U.S.’s outside back Taylor Smith that American coach Jill Ellis pulled Smith off in the 44th minute–and said she really should have replaced her 10 minutes sooner–in what was Smith’s last appearance for the national team. Well, it was deja vu all over again for the Americans in this match, as outside back Emily Fox was punished repeatedly by the speed of Delphine Cascarino and the rest of France’s right side. That mismatch led to the first goal of the night, as Cascarino beat the UNC sophomore for both speed and power before serving Kadidiatou Diani in the box. PSG’s forward, tasked with answering France’s perennial question at striker, didn’t miss, opening up a 1-0 lead for les Bleues in the 9th minute. Diani wasn’t done either, doubling her tally early in the second half with a cheeky spinning shot over Alyssa Naeher that drew plenty of oohs and aahs from the crowd. All we can say is what a goal from Kadidiatou Diani. With the match seemingly in hand, France coach Corinne Diacre gave the people what they want, substituting starlet Marie-Antoinette Katoto in up front with 20 minutes still to play. Diacre had harsh words for Katoto earlier in the week, but Katoto answered on the field, scoring France’s third of the night after splitting the center backs and rounding the keeper. If you were having flashbacks once again to last year’s SBC, it’s probably because, yes, Le Sommer scored exactly the same goal against the Americans. 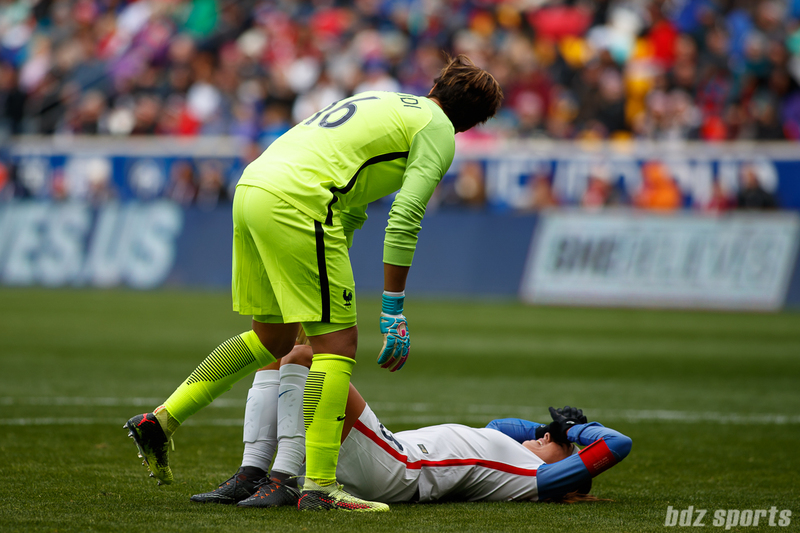 The U.S. made a late push, and spoiled the shutout with a stoppage time goal from Mallory Pugh on a sneaky roller that curled around a diving Sarah Bouhaddi. Pugh joins Izzy Christiansen as the only player across all competitions, club and country, to put multiple goals past Bouhaddi since the start of the 2017 Euros (Christiansen scored twice for Manchester City at the 2017 Toulouse International Ladies Cup). So what does France’s big win mean? If you ask the Americans, not much. There’s been no panic from the tournament favorites, and the American media have been quick to point out that the U.S. didn’t start its best XI, with stars like Megan Rapinoe, Tobin Heath, Rose Lavelle, and Julie Ertz all on the sidelines. So maybe we put an asterisk on this win . . . or maybe we note that the asterisks are starting to add up, with France 2-0-1 in its last three against the U.S., outscoring the Americans 7-2 in those matches. For France, the team has smartly stayed humble in the aftermath of the victory, noting that you can’t win the World Cup six months early, and recalling a 2015 victory over the U.S. that still ended with the Americans lifting the World Cup later that year. But if a quarterfinal matchup with the U.S. is in the cards, there should be no doubt within this group that they can–and maybe should–beat the Americans in Paris. Though they were held off the scoresheet, all six Lyon players started for France, and they each put in a good shift. In addition to Cascarino’s assist on Diani’s opener, Wendie Renard had a goal ruled out on a dodgy offside call, and Le Sommer, Amel Majri, and Amandine Henry were as disruptive and dominant as ever. Checking in on our former Fenottes among the American ranks, Alex Morgan was held in check by Renard and the French defense. Morgan rarely threatened, and her most notable moment may have been when she got leveled in the box as Bouhaddi beat her to a ball in the air (the parallels with last year’s SBC match just keep coming). As for Morgan Brian in midfield, the stats were more flattering than eye test. But Brian returned to her old stomping grounds in Lyon at the end of the break to spend a few days with her friend and former teammate Shanice van de Sanden, so we’ll give her extra points for that. Up next for les Bleues, the road to the World Cup continues with another heavyweight battle, as they’ll take on Dzsenifer Marozsan’s Germany squad in Laval on February 28. Shanice van de Sanden won the prize for most miles traveled this break, as she and her Netherlands teammates ventured to South Africa for a far afield friendly. The long flight didn’t slow the European champs down, though, as they picked up a 2-1 win over the hosts. Van de Sanden started on the bench, but came on for Lieke Martens before a half hour was up. The team took time to visit a local school while in Cape Town, and per usual, seemed to be having more fun than just about everyone else. Thank goodness they locked down the last European slot at this summer’s World Cup. The tournament just wouldn’t be the same without them. After a brief hiatus, Jess Fishlock returned to action with Wales, this time with a more impressive title after her name. Lyon’s only Member of the Most Excellent Order of the British Empire remains Wales’ most capped player, male or female, and it was great to see her back out with her national teammates. Well, we use the term “see her” loosely, as Fishlock did her best masked crusader impression while she recovers from a broken nose suffered during Lyon’s Coupe de France match against Rodez. This is Lyon’s second straight year fielding the (wo)man in the mask, so we have to ask: Who wore it best? Fortunately, Fishlock was easy to identify thanks to Wales finally putting the players’ names on the back of their jerseys. Long overdue and a well-earned reward for a plucky squad that’s got their sights set on the 2021 Euros after missing out on a spot in France this summer. The team fell 2-0 to Italy. Kadeisha Buchanan’s Canada team met Norway in La Manga, Spain in a matchup of teams hoping to make some noise at this summer’s tournament. The closed-door friendly ended in a 1-0 win for Buchanan’s side, with a 66th minute goal from living legend Christine Sinclair the only difference between the sides. Buchanan played the full 90 on Canada’s backline, and ended the game as captain of the Canadian side when Sinclair was subbed off in the 83rd minute. Canada also played Switzerland to a scoreless draw in a training match earlier in the week. England and Germany both chose to ease into 2019, running team camps rather than friendlies for the winter break. Lucy Bronze and the Lionesses spent the 8-day break checking out the new stadiums in Qatar, and still found time to pick up a win in an intrasquad friendly. Dzsenifer Marozsan and Carolin Simon’s Germany squad held training camp in Marbella, Spain, as they get used to life under new head coach Martina Voss-Tecklenburg. Simon seems to be moving closer to a return to action after a prolonged absence due to injury, which will add some some welcome depth back to OL’s back line. And she showed off some sweet juggling skills, which we’re always happy to admire. The gang has made it back to Lyon, and now heads to Soyaux for an away match in the Coupe de France Round of 16. Kickoff is on Sunday, January 27 at 14h30 local time (8:30 a.m. ET / 5:30 a.m. PT). Follow Lyon Offside (@LyonOffside) and Arianna (@AScavs) on Twitter! It’s here! Lyon Offside’s first ever podcast!